After the rumbling bass, Las Vegas glitz and LED razzmatazz of LG's CES keynote, Netgear had a hard act to follow. From the off it didn't look entirely promising: a smaller room, no swags of blue lights, no magically revolving screens and a generally subdued feel. Dig under the superficial and go beyond the shiny and the two briefings did have one unifying central concern: digital freedom. LG talked about "breaking down boundaries" between devices and between people. Netgear's mission was writ large: letting users viewing their content "anytime, anywhere and media and any screen"
Raising his arms messiah like, Negears Vivek Pathela VP and General Manager For Home and Consumer Products proclaimed: "Netgear is the heart and soul of networking." His posturing was certainly tongue in cheek but many true words are spoken in jest. No matter how good that OLED TV is, it's going to remain pretty useless without content. That's where Netgear sees itself chiming in. It's the heart of your digital home pumping content out to screens, PCs, digital picture frames, phones and all the rest. Netgear's Drew Meyer, Director of Marketing for the firm's Network Storage Business Unit, took the stage and provided the proof. The first product to strut its media sharing stuff with the Stora. 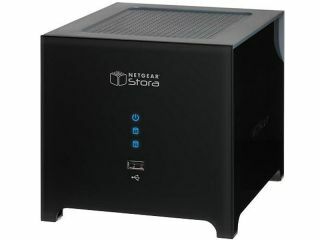 Meyer described the unassuming and modestly sized device as "not your Grandfather's NAS." Sure it was NAS like – it was a central networked storage hub but with some pretty impressive secret sauce. From any device with a browser you can access movies, music and pictures stored on the device. The Stora also dovetails with Facebook adding the ability to share content socially. The demonstration showed an iPhone and a PC both pulling content over the internet from the shiny littler server. But who wants to look to rough and ready, low def content on a 62in HD screen Meyes asked? All you'll get is a better view of how badly encoded and poorly produced the content is. Add a flaky broadband connection into the mix and suddenly and desired digital freedom becomes a less compelling. Again – living up to its claims of your content when you want it where you want it – Netgear had an answer. It demoed an innovative video processing system intended to take a broadband HD video feed and rid it of low-latency stutters. The system, it was claimed, should also make standard definition video pleasant big screens. During the twin monitor demo, the system did indeed make HD video stream smoothly. As for its up-scaling prowess, it was difficult to tell from our seat in the audience but given the likes of Cyberlink's PowerDVD upscales video so well we've no doubt the technology works well. Digital freedom – the ability to easily move content between devices – was also a topic on Pioneer's lips. Ted Cardenas, Pioneer's Director of Marketing in the Mobile Entertainment Business Group, explained: "In past we lived in the unconnected world." Devices in the home didn't communicate with each other and transferring music from the home to the car was even more fraught. "In the future, Pioneer sees a connected world," Cardenas stated. Central to that vision is the Platform for Aggregation of Internet Services or PAIS for short. Essentially it's an open standard designed to allow many devices and services to be interface happily. Cadenas said: "PAIS is opened up to other device manufacturers today." As part of its drive to make content pass easily between any home device and the car, we saw a demo of Music Sphere. It was iTune plug-in which analyses your music collection and automatically organises play lists based on the tunes' characteristics. Those play lists can then be easily access through a driver friendly interface on a car stereo's LCD touch screen. Your music, movies and photos should love 2010. Many big voices at CES are singing the same tune: content should, can and will move between all your devices with magical ease.